According to PRC press reports, China is about to begin what is arguably its most important space mission since October 2003, when the Shenzhou V spacecraft successfully carried China’s first astronaut into space and safely returned him to earth. Shenzhou VIII, which is now on the launchpad undergoing final checks, is set to take-off on November 1 at 5:58 am China Standard Time (5:58 pm Oct. 31 EDT). Shenzhou VIII will be operated as if it were carrying humans into space, but no Chinese astronauts will be on board. That is precisely what makes this mission worth watching. Shenzhou VIII is scheduled to autonomously rendezvous and dock with the Tiangong I, an experimental laboratory China launched into space just over one month ago. The 8-ton Chinese space lab reportedly has enough resources to sustain one Chinese astronaut for 60 days, suggesting that future piloted missions to the lab during its scheduled two-year operating life will be relatively short by international standards. CCTV announced that the current pressure, temperature and humidity aboard Tiangong 1 are being maintained as if astronauts were already aboard the station. Making sure those parameters are stable before, during and after docking with the Shenzhou VIII spacecraft will define whether this mission is a success or failure. 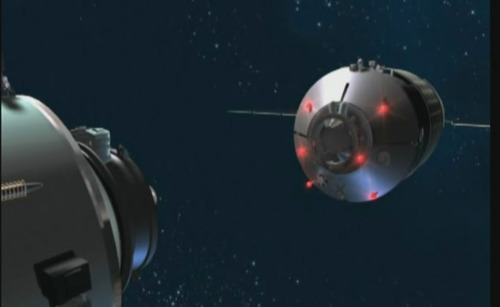 China’s two data relay satellites, Tianlian 01A and Tianlian 01B, will play an essential role in the docking mission. According to explanations from mission controllers, not only will they track and communicate with both the Shenzhou VIII and Tiangong 1 spacecraft, they will also transmit data about the progress of the docking maneuver and conditions aboard both spacecraft to controllers on the ground, who will be the monitoring the activities in real time. The current docking mission will be conducted autonomously by the spacecraft themselves using indigenously developed Chinese technology. In the event of unexpected problems with the autonomous docking system, ground controllers can also intervene and conduct the docking maneuver manually. Chinese engineers noted during interviews on CCTV that the skills and technology tested on this mission can be adapted to refuel and repair satellites in orbit. It is often said that necessity is the mother of invention, and China’s need to develop its own rendezvous and docking capability for its human space flight program is largely a product of US-led efforts to isolate China in space. China has been excluded from participation in the International Space Station (ISS) and is the subject of rigid US export controls that forced China to go its own way. If the Shenzhou VIII mission is a success, China will have crossed a critical threshold, clearing a major technological hurdle on its way to completing plans to construct the small space station that has been the ultimate goal of the human space flight program Chinese scientists and engineers first articulated in 1986. While speculation both within and outside of China is already beginning to turn to China’s longer-term plans, Chinese scientists and engineers remain fixed on this nearer term objective of an operating space station, which will fully engage the human, technical and fiscal resources of China’s human space flight program well into the early years of the next decade. Given the past history and present trajectory of China’s human space flight program, US space entrepreneur Robert Bigelow’s fearful speculations about Chinese colonization of the moon seem misplaced. But it is possible that China will, in the early years of the next decade, be in possession of the sole operating space station in low earth orbit. According to recent Chinese statements, however, they presently intend to be more generous towards other space-faring nations than those nations have been towards China.